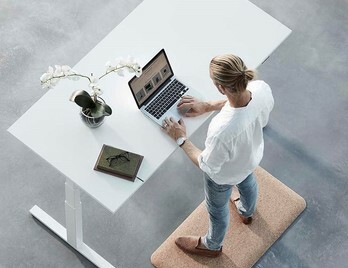 The gradual introduction of sit-stand desks and height adjustable furniture within the workplace will welcome us the opportunity to change our posture throughout the day. However even when adopting our new standing working positions we must still allow ourselves to keep moving or at least remain comfortable when standing. Standing for long periods of time of hard surfaces can be uncomfortable and cause physical fatigue. Leg muscles become static and blood flow is greatly reduced causing pain and discomfort. 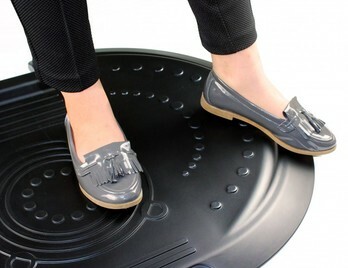 By standing on an anti-fatigue mat your muscles will gently contract and expand as they adjust to the flexibility of the mat. This increases blood flow and the amount of oxygen reaching the heart which will, of course, reduce strain and fatigue and increase productivity. The perfect accessory for the sit-stand desk, or for those who stand for long periods at work. The AFS -TEX Anti-fatigue Mat is a premium specification larger version of the AFS-TEX 4000 designed specifically for use with stand up desks. Contoured non-linear profile facilitates changing your standing position which significantly reduces fatigue compared to standing in a single position. This premium mat provides optimum cushioning and ergonomic support so is ideal to use with stand up desking. AFS-TEX is a unique range of anti-fatigue solutions designed to promote and encourage stand-up working and to combat excessive sitting which is now regarded as a health risk. This soft standing platform encourages regular movement and offers maximum fatigue relief, comfort, and productivity. The unique AFS-TEX Anti-Fatigue formulation combines standing comfort and ideal body support. Some users report that they were able to stand in comfort for up to 40% longer when using an AFS-TEX 2000 mat. AFS-TEX is a unique range of anti-fatigue solutions designed to promote and encourage stand-up working and to combat excessive sitting which is now regarded as a health risk. This soft standing platform encourages regular movement and offers maximum fatigue relief, comfort, and productivity. The unique AFS-TEX Anti-Fatigue formulation combines standing comfort and ideal body support. Some users report that they were able to stand in comfort for up to 50% longer when using an AFS-TEX 3000 mat. The Yoga Mat Standzon is a stylish holistic anti-fatigue mat that is ideal for standing on throughout your working day. Standing at work helps combat a restrictive static posture by elevating your overall wellbeing. The mat can also double up as a yoga or exercise mat, it's made up of a sound absorbing polyurethane material which is soft to practice simple moves on. Maybe work some new exercises and gymnastics on your lunch break or host a yoga class for your team? 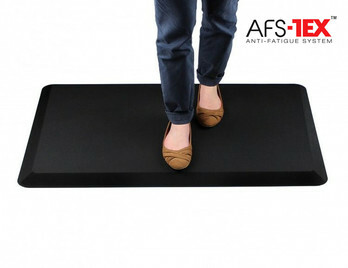 The AF Mat Standzon is a stylish holistic anti-fatigue mat that is ideal for standing on throughout your working day. Standing at work helps combat a restrictive static posture by elevating your overall wellbeing. A soft ergonomic mat with button pattern massage properties encouraging you to move gently whilst standing. 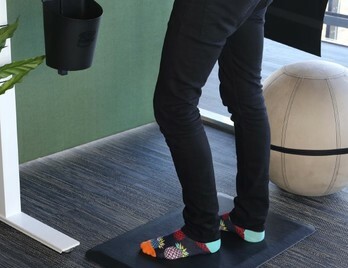 Ideal for standing on throughout your working day, making you feel stimulated whilst reducing tension. Standing at intervals whilst working helps combat a restrictive static posture by elevating your overall wellbeing and posture. A soft ergonomic mat with smooth pattern massage properties encouraging you to move gently whilst standing. Ideal for standing on throughout your working day, making you feel stimulated whilst reducing tension. Standing at intervals whilst working helps combat a restrictive static posture by elevating your overall wellbeing and posture. We are now at an important point within the evolutionary timeline of office furniture, breaking away from furniture which only meets the basic requirements of supporting us and our equipment. We now require furniture which is flexible to our needs and wants and seamlessly moves with us, as opposed to pulling levers and twisting knobs, in order to adjust and enhance our comfort levels. 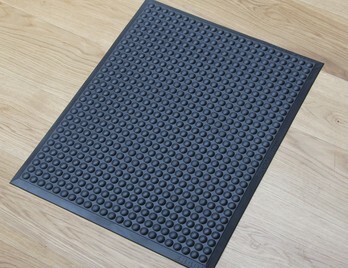 Although we are now making small movements towards standing up at work (or at least having the option to) we must still allow for ourselves to remain comfortable whilst standing, so anti-fatigue mats make an excellent alternative to standing on hard surfaces. An anti-fatigue mat will not only be more comfortable than standing on a hard floor but it will also encourage you to subtly move your leg and calf muscles, which inevitably will improve blood flow to the heart. This is called 'Dynamic Ergonomics' - the study of implementing worker comfort by means of muscle activity. 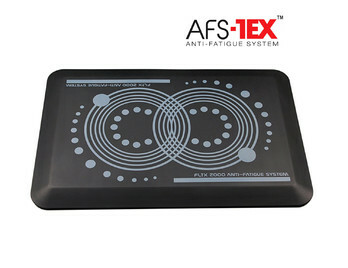 An Anti Fatigue mat is a fairly low-cost item that can benefit your health in so many ways and keep you energised and revitalised throughout the working day.